Looking for a quick remodel project this season to warm up your living room or den? It is winter after all and fireplaces will get the most use during the coldest months. When the fire is a-blazin’ your fireplace becomes the focal point of the room where it resides. This is a great time to update your fireplace or mantle. Cosmetically, you can improve the look and feel of your living or family room by updating the mantle or fireplace surround. You can also upgrade by adding new, modern fixtures. But you can also add energy savings and increased efficiency without tearing apart your hearth and mantel. For those living in older homes who have already begun projects to modernize them, fireplaces will often still reflect the look and design from the past. Wood, stone, brick – these can all be contemporized easily and affordably with new paint finishes. Perhaps lightening the finish on your brick, or painting it in a pop of color chosen by the experts at Pantone. How about ‘Purple Haze’, #18-3718 TCX? This smoky lilac would look bold and fresh against the backdrop of white or light grey walls. Purple Haze fireplace, light grey walls, white ceiling and crown molding and white sheer curtains with silver sashes? That would make quite a statement room! You can also refinish the woodwork, but wait until a warmer spring day since you’ll need to have the windows open. The paint remover can be quite toxic in closed quarters. 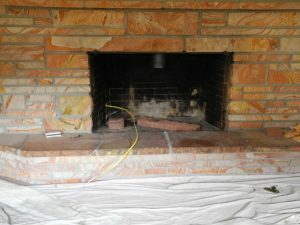 Old, crumbling brick fireplaces can also be wrapped in tile or wood. This will still leave the exposed brick for the firebox itself plus the brick is still beneath the new material, just in case a future home owner wants to restore it. Or, you could drywall or plaster over the old materials, to create a new surface and a blank canvas to display. A standard drywall installation on your fireplace remodel could be completed in two days. A more custom mantel design might take several weeks, in comparison. In the winter it’s more likely that you’ll finish a shorter project without compromising the heating of your home. Reminder: if you’ve been considering an update to your living, starting with the fireplace will give you great direction on the rest of the space. It’s the most functional part of your living room design and can set the tone for the remainder. Adding in new light fixtures are also a great way to update the look of your fireplace. You can choose electric lights or candle holders. Be sure to consult an electrician for any electrical work – just call Red Umbrella Services at 541.515.3843 for your quote. You can also add a dramatic new mantle or shelf to your fireplace. Check out some of these designs from Elle Decor. We love how our clients put their creativity into their spaces, in meaningful ways. Fireplaces get so much activity in the winter – add it to your to-do list this season!